The 2D TOCSY (TOtal Correlation SpectroscopY) experiment is a useful complement to the more familiar COSY experiment. Whereas COSY typically establishes correlations between protons over two to three chemical bonds, TOCSY can provide correlations between all the protons that make up a “spin system”. This ability of TOCSY helps identify discrete building blocks within a molecule, or distinguish spin systems from different molecules. Consider the following example of a mixture of 2-pentenal (A) and 5-epoxyhexene (B). The proton and COSY spectra of this mixture show considerable peak overlap in some regions, making peak assignments difficult. Fig. 1. Comparison of COSY (left) and TOCSY (right) spectra of a mixture of 2-pentenal and 5-epoxyhexene, collected on a Spinsolve system. Comparison of the 2D COSY and TOCSY spectra (Fig.1 above) shows how helpful TOCSY is. The boxed region of Fig. 1 shows the TOCSY correlations from the aldehyde signal of 2-pentenal to the four other proton signals from the molecule. 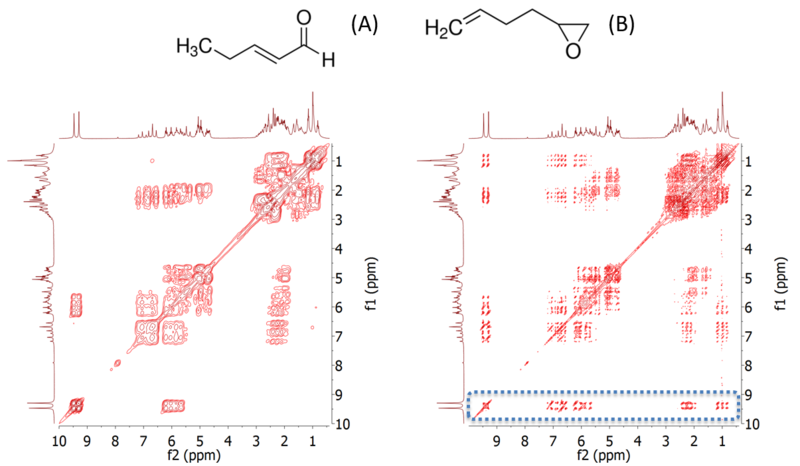 The aldehyde signal is well resolved from the other signals in the spectrum, so having the correlations makes it very straightforward to identify the other 2-pentenal resonances. Notice also the sharper peaks which are because TOCSY is a phase-sensitive experiment, which tends to provide higher resolution spectra.